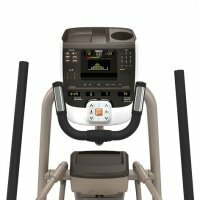 The EFX® 5.37 is our top-of-the-line Elliptical Fitness Crosstrainer™, with automatic CrossRamp® angles from 15 to 40 degrees, convertible handlebars, 15 preset programs, 4 User IDs, 20 resistance levels, touch and telemetry heart rate monitoring with SmartRate®, advanced metrics tracking and an advanced console. Heart rate chest strap transmitter included. Biomechanics Patented, low-impact EFX® motion is smooth and natural, providing the lowest Rate of Perceived Exertion of any cardio exercise system to make your workouts more comfortable, even though you are working out strenuously. The patented motion allows your heels to remain in contact with foot pedals, reducing muscle and tendon stress. User IDs User IDs allow you to enter and store personal preferences to quickly retrieve for future workouts. A great option for households with more than one user, so you each can store your preferences.